This is a surprising 5th entry in the series of interviews I’m translating from the Sound! Euphonium official fanbook published last week by Takarajimasha. It’s surprising because my original goal was to only complete the previous 4 entries, but the story felt unfulfilled. To that end, I decided to translate the final two pieces to complete the tale. Here is the interview with the person who oversaw all the episodes as animation director and designed the characters for the anime. Animator at Kyoto Animation. Notable works include her work as character designer/CAD for The Melancholy of Haruhi Suzumiya and animation director for many shows. – What were your impressions after reading the novel? At that time, there was only one novel published and only the cover was illustrated. Therefore, I was ordered to capture the image of the cover art. Director (Tatsuya) Ishihara-san said “I want to keep the atmosphere of the novel’s illustration,” so I began searching for designs that met that desire. – And so did it take you many stages until you reached the final design for the character? – So you used the illustration on the top page of the official novel site too? Right. There came to be a lot of novel illustrations, so that image was strengthened. I temporarily put aside what I had done to that point and, once again, injected a little more of Asada-san’s taste in their designs. At that time, the main characters’ hair were longer, so I thought about returning to the starting point and beginning again with a large silhouette that would match that image and structure their faces again. – It sounds like you started with Kumiko, Hazuki, Sapphire, and Reina before moving on to everyone else. Well, those were the designs I had drawn that would have been used for characters with those names. However, as I said we had many twists and turns, the main four’s designs weren’t approved. As we were close to production time, I designed the other concert band members before returning to them. If we couldn’t approve those 4’s designs, there’s no way we’d have time to finalize designs for 60 other band members. (laughs) I also felt that by drawing those other members, I’d be able to adapt my style and better sense how the girls would be drawn. – What points were different between the early drafts and the final versions? Small details like how the early version of Kumiko had a hairclip on her hair. I wanted some kind of trait that made her look like a protagonist, but in the end I had to stop adding extraneous points. Hazuki’s has completely changed; her first design had her wearing twintails, but that’s how her atmosphere was like at first. Series director (Naoko) Yamada-san was fussy over Sapphire’s skirt being long. “Since she’s so short, I want her to have a long skirt so her silhouette looks triangular.” I stopped its length in the final design on the longish side. Her socks having pompons was also Yamada-san’s idea. That reminds me, Kumiko at first had an ahoge. Ishihara-san had said “if someone has an ahoge, it feels moe-ish,” but in the end, it was Sapphire who has one, not Kumiko! (laughs) I thought it would be better to have Reina also hold some type of character trait, so her early designs had her wearing a hairband. – What about the upperclassmen? I drew Asuka as being this older “big sister” looking character, but Ishihara-san immediately rejected it saying “Asuka is cuter than this.” (laughs) Asada-san’s manga has a cute girl who wears glasses in it, so I included those aspects into her design to try and bring it closer to that. 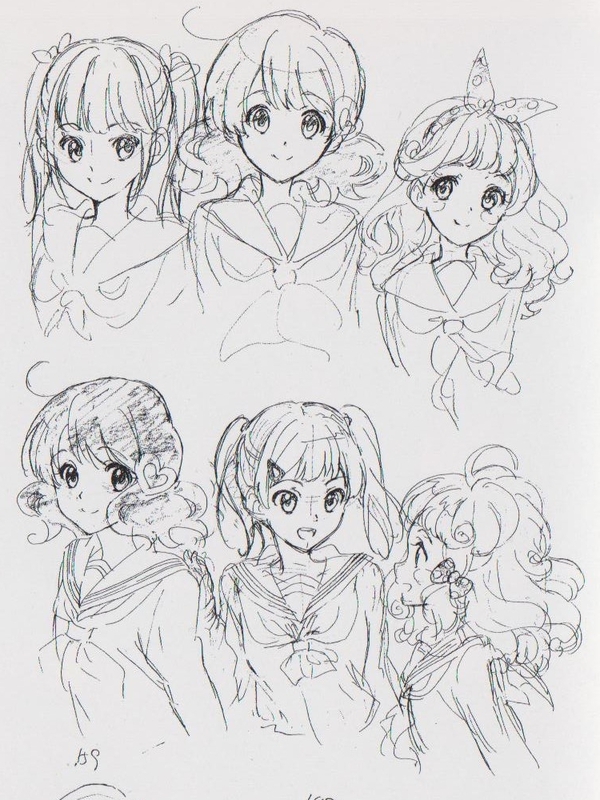 Haruka’s early designs are close to what became the final version. My impression of her from reading the novel was very faint, so thought it’d be nice to balance her design from Asuka’s. 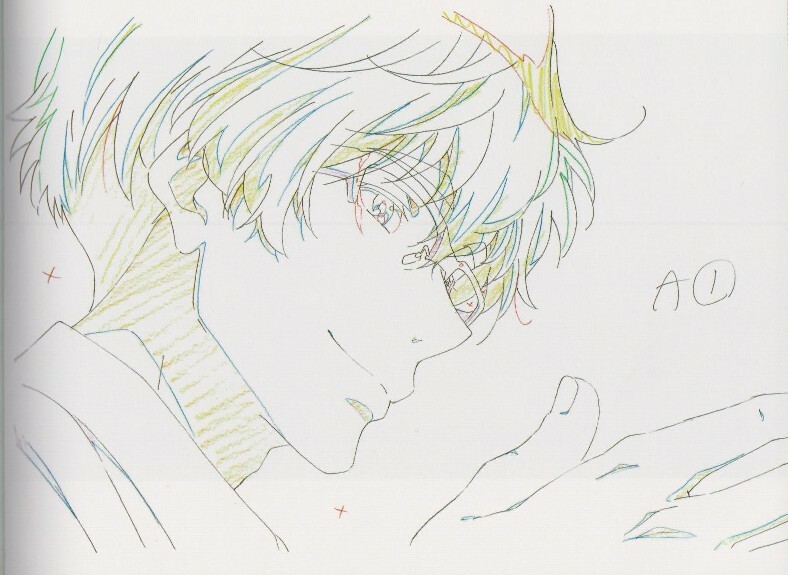 Yamada-san was pleased with her design and it had more or less been solidified when the second novel illustration was unveiled. She was in the middle of it, so I meekly went back and used it as a base. Aoi was done by me saying “I want to draw someone with braids” and it was okayed without much resistance. – The second years Natsuki and Yuuko are also impressive. Those two are characters who had no novel illustration at all. Yuuko was a revival of the design I drew for Sapphire with longer hair, but with a stylish knotted hairband. And since she adores Kaori, she has to be someone who’s immensely cute. If a uncute girl is adoring for a cute girl, it just looks kinda pitiful, doesn’t it? So to remove that impression and keep their relationship the way it is, I made sure she looked very cute. It was an unusual claim. (laughs) Natsuki looked awful with her glare and short hair like the novel described. I thought she’d look cuter if I made her hair a bit longer and then I put her hair in a ponytail since no one else’s was in one. – How did you decide on Taki-sensei’s design? I worked on his design as Yamada-san was fixated on what form it would be. At first she said “he should look like a certain actor” and so I drew him like that. Then she said “it’s too much like him.” (laughs) At the very end, I reframed his image to give him more of a soft impression and gentle expression. 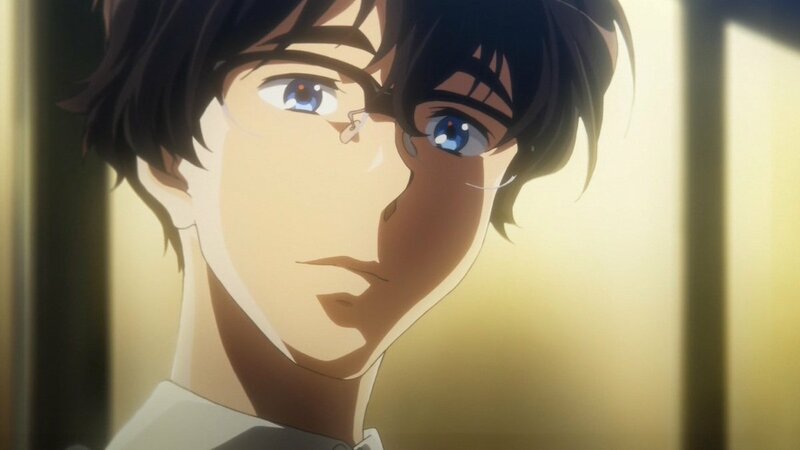 – Having glasses was something unique to the anime. That’s right. My order from Yamada-san was “he should feel dreamy with his glasses and wearing a cardigan.” Ishihara-san also left everything relating to Taki-sensei to Yamada-san. (laughs) With his good looks and short hair not matching the description of the novel, I had a different impression of him, but in the end I’m happy with how his character looks. – What kinds of things were you conscious of while working as chief animation director? I immediately contacted the animation directors so that we could have a better unified impression and improve the quality of the work while keeping that unified impression. For my part, I was absorbed in ensuring that the characters appeared the same. – What did you feel while you were checking the character drawings? Everyone was able to properly visualize Yuuko, or rather I had properly conveyed how to draw her cutely. (laughs) In comparison, Sapphire has a complex hairstyle, but everyone was able to imitate it well. Conversely, I remember having to correct Taki-sensei and Gotou-kun a lot. Taki-sensei’s hairstyle is a characteristic that is new to KyoAni works, so perhaps there was a high level of difficulty. – While working as CAD, what impressions remain while you were looking at the work? The work from (Nobuaki) Maruki-kun in his episodes 5 and 12 as AD had too many lines. At first I was puzzled as what to do. (laughs) Trying to get everyone else to match his work or to alter his work to match everyone else’s would be too difficult, so I left them as-is and sent them on. In the end, both are important episodes, so I thought it would be good to have impressive visuals in them. – As its part of this work’s theme, what parts were you particular about with the instruments? That’s right. We have about 20 experienced musicians at our offices, so when a point came up where someone couldn’t understand how to draw something, they would consult one of those people. The staff would position the 3DCG materials for the instruments exactly how a character would be holding it and then use that as a base when drawing the scene. However, using those 3DCG materials was a bother. If everyone waited to use them, it would take too much time to finish an episode, so the people standing would draw while they waited to use the machine. As the CAD, I have my own problems at times when I’m drawing the promotional images as well. For (Hiroyuki) Takahashi-san to serve as instrument AD by himself is nothing less than amazing. – When you were drawing the performances, did you use real performances as a reference? Of course. We recorded some performances as they were necessary for drawing our scenes. We would match the timing from the spots on the video in our timesheets to keep that impression. I paid attention so that the work done to replicate an actual performance didn’t have any mistakes in it. – Ikeda-san, what drawing to you was a highlight of this work? For drawings, it has to be the scene in episode 12 when Kumiko runs along the bridge. And then as a scene I was incredibly picky about, it would have to be the reunion of Kumiko and Azusa in episode 5. There were a ton of amazing pink-colored director correction sheets indicating the animator should “pull back the line of her eyebrow until it’s reliable” from (Ichirou) Miyoshi-san. Here too Maruki-kun supported me by raising the quality greater than I ever thought. – Please give your final impressions regarding this work. I think the entire staff, not just myself, poured themselves into this show while making it. We were continually in high spirits as we headed to the final scene. Usually it’s normal for people to feel cornered due to the strict schedule of events. Along with everyone’s running passion to make something great, I felt we were able to keep the strengths of the novel. 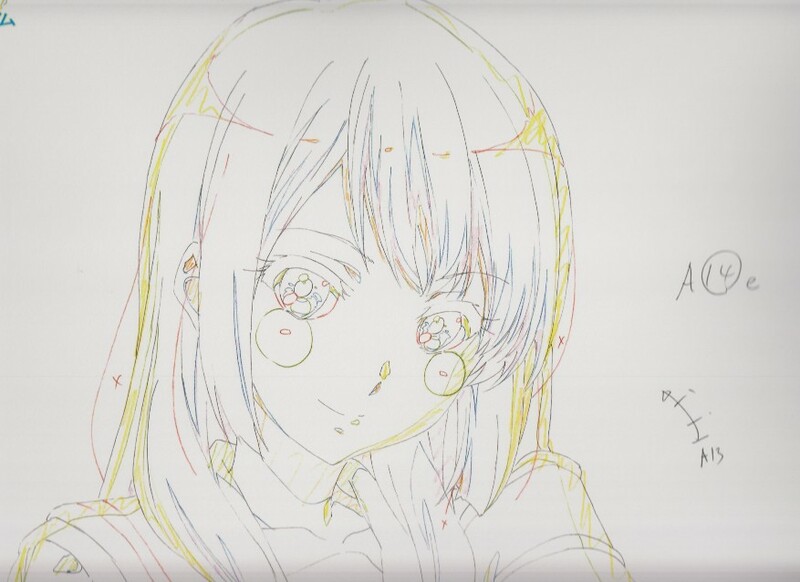 This entry was posted in Hibike Euphonium, Kyoto Animation, Translations and tagged character designer, chief animation director, interview, shoko ikeda, sound! euphonium, Translation. Bookmark the permalink.